I did mention in my previous post (I work out https://kavyabasavraj.com/2012/10/21/i-work-out/) that I typically start my workout with a 5-10minute warm up followed by (>;;;) 30-40minutes cardiovascular exercises >;;; 15-20 minutes strength training >;;; 10-15 minutes abdominal exercises >;;; 5-10 minutes cool down/stretches. Below is a detailed description of my schedule. I was recommended to do a warm up before stretching. Initially I was confused and I did somehow think that these two terms meant the same! 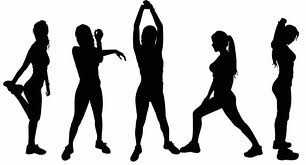 However, basically a warm up is done to prepare your body before an intense physical workout. So some warm up exercises are light jogging etc. Since I live few floors above the gym, my warm up will be taking the stairs down to the gym. I am talking about walking down 8 floors and doing a little spot jogging. So a total of 5-8 minutes is spent there. Moving on…..
After I have sufficiently warmed up, I do some stretching for the next 5-8 minutes. This typically includes arm, back, sides and leg stretching. 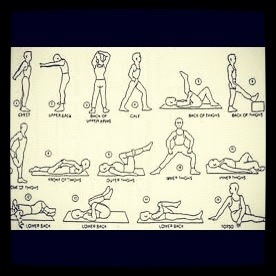 I maintain each stretch for about 15-20 seconds and repeat it twice. I did mention earlier that Monday is when I am highly motivated to perform to the best of my abilities. On the first day I always try and get some serious high impact, high intensity running on the treadmill for about 30-40 minutes. BUT this will not be a steady-phase running. I like doing interval training which I believe is an ‘actual cardio workout’! I begin walking at 5.0km speed and gradually increase it to 5.7km the following minute and 6.3km further. So basically I am gradually increasing my heart rate for the first 3 minutes. Interval 1: I then increase the speed to 8.0km and keep the phase steady for next 6 minutes. 8 minutes past me running I then change the speed to 12.0km and run for 30-40seconds at this phase and later bring down the speed to 8.0km for the next 20seconds and finally I bring down the speed to 5.5km. I walk at 5.5km for a minute so I am giving my body time to recover and at the same time to cheekily give my already tired legs a rest and I treat myself to a sip of water. I repeat the process as Interval 1 where I run at a constant speed 8.0km for 9 minutes and then increase speed to 12.0km for 30-40seonds, bring down the speed to 8.0km for the next 20 seconds and walk for the next minute at 5.5km speed. By now I am done with 30minutes running. I later do a 5 minute ‘random interval training’. Random interval: So once I finish my 30minute run I change the treadmill settings to ‘speed interval’ where the jog speed being 5.0km and the run speed, 12.0km. At the 31st minute, I change my speed interval to the ‘running mode’ at 12.0km for 30seconds and after 30seconds I change the speed to jog speed where I am walking at 5.0km. I keep repeating the same for the next 6 minutes (I try and make sure I get 6reps). Cool down: 36minutes past and I am all sweaty and achey I gradually keep decreasing the speed from 5.5km >;;;; 4.7km >;;;; 4.0km and finally I stop at 3.3km. I do a 1 minutes stretch after and end my cardio session. So on this day, I am working on my upper and lower body muscles. 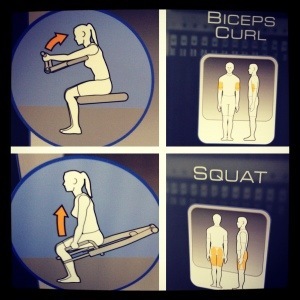 I am aiming for the shoulder, back and biceps as an upper body workout. 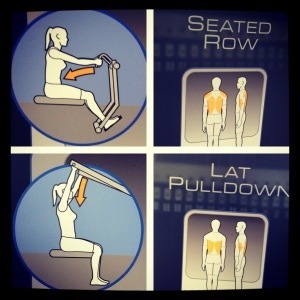 For this, I use the seated row, lateral pull down and bicep curl. I do squats for my bum and thighs as a lower body workout. 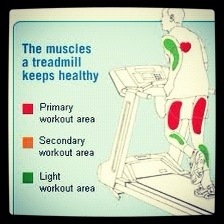 Since I am using the squat machine, I work my upper and lower body too which gives me a total body workout. After I have completed my strength training, I work on my abdominal muscles. For this, I use the ‘abdominal cruncher’. I keep my workout very simple for this day. I do the traditional ‘forward crunches’ (about 200 crunches) and, ‘side crunches’ (about 100 on each side). I complete about 25-30 push ups and plank for 10-15 seconds each for 3-5 reps. And finally…..
After all the initial warm up, stretches, cardio, strength training and abdominal workout, I typically end my workout with a good stretchI normally follow the stretch routine shown in the picture, which typically includes stretching my arms, shoulder, back, thighs and calf muscles.